Beginning Small Cluster [Beg SmCl]: Ch 2, dc. Small Cluster [SmCl]: YO, insert hook in space. YO and draw through two loops on hook. YO, insert hook in same space. YO and draw through two loops on hook. YO and draw through remaining three loops on hook. Beginning 4-Dc Cluster [Beg 4DcCl]: Ch 2. YO, insert hook in same space. YO and draw through two loops on hook. YO, insert hook in NEXT stitch. YO and draw through two loops on hook. YO, insert hook in same space. YO and draw through two loops on hook. YO and draw through remaining four loops on hook. 4-Dc Cluster [4DcCl]: YO, insert hook in stitch. YO and draw through two loops on hook. YO, insert hook in same stitch. YO and draw through two loops on hook. YO, insert hook in NEXT stitch. YO and draw through two loops on hook. YO, insert hook in same space. YO and draw through two loops on hook. YO and draw through remaining five loops on hook. 4-Tc Cluster [4TcCl]: YO twice, insert hook in stitch. (YO and draw through two loops on hook) twice. YO twice, insert hook in same stitch. (YO and draw through two loops on hook) twice. Skip sc. YO twice, insert hook in NEXT stitch. (YO and draw through two loops on hook) twice. YO twice, insert hook in same space. (YO and draw through two loops on hook) twice. YO and draw through remaining five loops on hook. Rnd 2: In same sp as joining, work (Beg SmCl, SmCl, ch 3). * Sk ch-2 sp. Work (2 SmCl in the next st, ch 3). Rep from * six more times. Sl st to dc of first Beg SmCl. Rnd 3: Work Beg 4DcCl across joining stitch and next stitch. Ch 3. Sc in ch-3 sp. Ch 3. 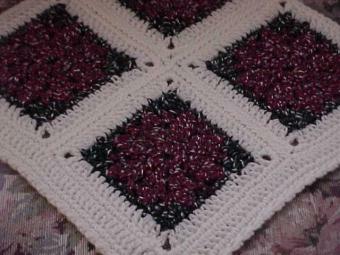 * Work 4 DcCl across next two stitches. Ch 3. Sc in ch-3 sp. Ch 3. Rep from * six more times. Sl st to top of Beg 4DcCl. Fasten off Burgundy. Rnd 4: Join Hunter to any ch-3 sp to the left of any 4DcCl. Ch 1, sc in same sp. Ch 4. Work 4TrCl across this sp and the next sp. Ch 4. Sc in same sp. * Work 3 sc in next sp. Work sc in next sc. Work 3 sc in next sp. Work sc in next sp. Ch 4. Work 4TcCl across this sp and the next sp. Ch 4. Work sc in same sp. Rep from * twice more. Work 3 sc in next sp. Work sc in next sc. Work 3 sc in next sp. Sl st to beg sc. Fasten off Hunter. Rnd 5: Join Soft White with sl st to the top of any 4TcCl. Ch 5. Dc in same sp. * Work 3 dc in ch-3 sp. Work dc in each of next 9 sc. Work 3 dc in ch-3 sp. Work (dc, ch 2, dc) in top of 4TcCl. Rep from * twice more. Work 3 dc in ch-3 sp. Work dc in each of next 9 sc. Work 3 dc in ch-3 sp. Sl st to 3rd ch of beg ch. Rnd 6: Ch 1. (2 sc, ch 2, 2 sc) in ch-2 sp. [corner made] Sc in each st around, with (2 sc, ch 2, 2 sc) in each corner. Sl st to beg ch. Fasten off. 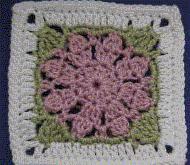 With Soft White, whipstitch squares together according to the photograph with 9 rows of 7 squares. Rnd 1: Join Soft White to any corner. Ch 3. Work 4 dc in same sp. Work dc in each st around afghan, with 5 dc in each corner. Sl st to third ch of beg ch. Rnd 2: Ch 1. Work sc in each st around, with 5 sc in each corner. Sl st to first sc. Rnd 3: Ch 1. Work (reverse hdc, ch 1, sk 1 st) around. Sl st to first ch-1. Fasten off.